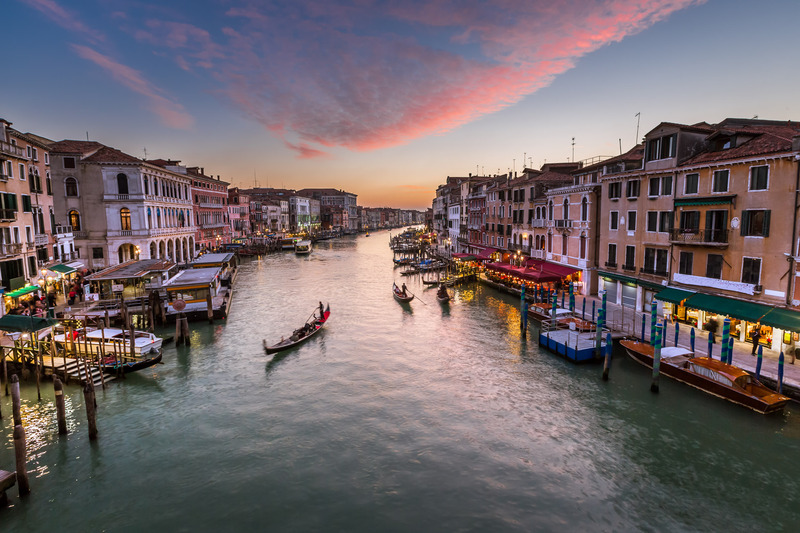 This view from Rialto Bridge is one of the most famous views in Venice. It was the first bridge to ever connect the two sides of the Grand Canal. Up until 1854, it was the only place you could cross the canal on foot. March 2014, single image, additional exposures for highlights, focal length 16mm, aperture f/11, shutter speed 0.6 seconds, ISO 100, tripod. Could you imagine this being your view on the way to work every day? Dodging the crowds after taking my first shot in the North-East direction, I quickly moved over to this South-West direction to get the right evening light. It is a bit tricky due to the unique layout of Venice in this place. From this angle I can get great colors in the sky with not as great lighting for the architecture. The facades are in the shadow and there is nothing really one can do about it. Usually I shoot during the sunset which always turns out the most beautiful shots. Yet as a photographer you are always compromising with something. The sun especially proves to be a point where you need to think on your feet. Do you want the sun in your frame or behind you? If you shoot with the sun behind you, it makes for less interesting sky. If you shoot with the sun in front of you, that means losing some details on the architecture. Lucky for me, the facade illumination and city lights went on and balanced off the backlighting of the sun. And I was able to get best of both worlds – spectacular sky and nicely illuminated architecture details. This entry was posted in City and tagged Italy, Venice.